Art and Survival: Environmental artist Patricia Johanson melds art into such necessities as sewage treatment. We're just a few feet into the water, and already I'm convinced that my decision to take a boat ride to unlock the secrets of the Petaluma River may have been misguided. I'm a landlubber. But in front of me is Petaluma River Keeper David Yearsley and beside me is someone else, an artist. She's someone who has become known throughout the world as a visionary of environmental designs that combine the civic usefulness of sewers and parks with imaginary realms. She's slight of build and dignified, with an energy that has seen her through cancer and more than a few city hall battles (not to mention this boat ride). On this trip, though, we're just three people floating inches above the water, the flow pounding the boat's metal rim too quickly and closely for my tastes, as the river keeper, the artist and I approach the wetlands, the sunken bridges and other mysteries of the river. In this moment, I move from being a reporter to joining the artist and the river keeper as part of the environment, a process that is both political and philosophical. The artist's name is Patricia Johanson. Her art became the spiritual center of the ongoing saga in the creation of the Petaluma Wetlands Alliance, a nonprofit group devoted to restoring and protecting Petaluma's Shollenberger Park, the Alman Marsh and other area wetlands. My river trip reminds me that the ordinary moments and the great ones are part of the same landscape. It is a good memory, a simple moment. For Johanson, it is a moment of connecting with the sense of place that has influenced her large-scale environmental civic art from Asia to Africa and beyond. 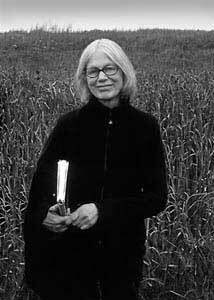 Johanson has been lauded throughout the world with good reason; her innovative designs for such humble necessities as sewage-treatment plants are also rich with an implied philosophy for a sustainable world, underscoring her de facto position of artist as savior. Caffyn Kelley's new book, Art and Survival: Patricia Johanson's Environmental Projects (Islands Institute; $24.95), released this month, chronicles the development of an art that if fully applied, would do nothing less than preserve, revolutionize and sustain civilization indefinitely into the future. Johanson's ability to integrate her environmental art into a world that's been pretty well ravaged by modernity makes her unique. She represents a different sensibility, one that demonstrates that civic progress is compatible with sustainability--that sustainability is, in fact, civic progress. Of course, Johanson is not without her critics. She ran into problems typical of such civic projects in Brockton, Mass., where her early attempts at creating the Rocky Marciano Trail (in honor of Brockton's boxing great) collided with a local controversy still steaming over whether Marciano's image was one the city should project. Even here in progressive California, opponents of the PWA's proposed wetlands project may have opted for a more invasive method of algae filtration than that proposed without the pro-Johanson public outcry. "It is like being a doctor. You have to do the best you can for each new patient, even if the last one died," Johanson writes via e-mail from New York, where she is working on a new project. "The frustration arises from the fact that artists have no control over anything (and certainly not the civic process!). Usually what is designed and what is built are two different things, and often the artist is not even consulted during the construction phase. I have never been happy with any of my projects from an aesthetic point of view, and yet they work pretty well socially and ecologically. There has never been any question in my mind that the public and wildlife benefit from my involvement in these projects, so I have to settle for that." Locally, Johanson's designs for a wetlands walk that would also connect with the city's popular Shollenberger Park (first created as a site for dredging spoils) galvanized the Petaluma community to get behind a more sustainable design for the new sewer plant and led to the ongoing creation of the adjoining wetlands park. "Civic projects depend on the will of local politicians, ordinances and funding, not to mention all the special-interest groups that will either support, or try to sink, the project," writes Johanson. "Since art is seen as peripheral to whatever is being built--the icing on the cake--it is usually the first casualty of budget cuts. The role of the artist in civic projects depends a great deal on what the artist is willing to accept. I do not even consider projects that are too specific in their program requirements. And, of course," she adds, "I have my own agenda, which includes social and ecological inclusiveness within a natural setting." Natural settings can also include roadblocks. Johanson has had to come to terms with maintaining her artistry and perspective at the same time. It's a dance where art, architecture, philosophy and civics join together, often with unpredictable results. "The essence of all these projects," she says, "is dialogue, problem solving and compromise." And for Patricia Johanson, the human and natural landscapes are one.